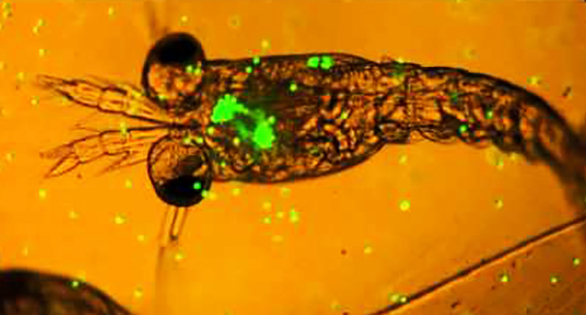 Marine zooplankton with green-glowing microplastics it has ingested. Greatly enlarged. Vancouver, B.C. Tiny marine zooplankton are ingesting microplastic particles at an alarming rate, according to a new study by Dr. Peter Ross, head of the Ocean Pollution Research Program at Vancouver Aquarium Marine Science Centre. Starting here near the base of the aquatic food web, the potentially health-threatening plastics will radiate up the chains of predators and prey, finally accumulating in important food fishes, such as salmon, and in apex species such as whales and humans. It’s the first indisputable evidence that the smallest animal species at the bottom of the food web are mistaking plastic for food, which raises troubling questions about species that rely on these invertebrates for food. Marine zooplankton shown ingesting microplastic particles in video made at UK’s Plymouth Marine Labs by Dr. Matthew Cole and Verity White. YouTube. Dr. Matthew Cole, a researcher at the Plymouth Marine Laboratory who has been researching the impact of so called ‘microplastics’ on marine ecosystems, said the impact of microplastics on plankton has been largely overlooked until recently. 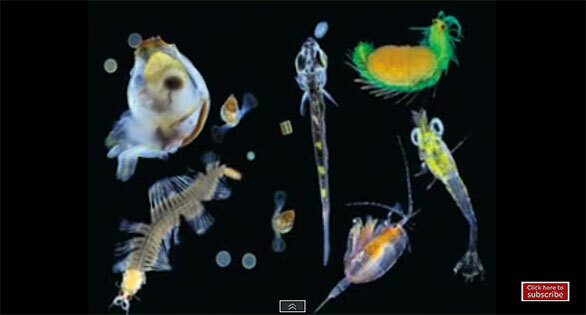 Zooplankton represent a critical energy source in the worlds’ oceans and a vital food for many fish and marine mammal species. The potential transfer of microplastics in the food web, from zooplankton to Pacific salmon that ingest them, would be a great concern given the importance of salmon in our regional ecosystems, said Dr. Ross. These particles could pose a serious risk of physical harm to the marine animals that consume them, potentially blocking their gut or leaching chemicals into their bodies. Video: At about a half a minute in, this video shifts to a microvideo image of live plankton ingesting plastic microbeads that glow green. These tiny beads are found in various modern soaps and toothscrubbing pastes. The Ross team also notes the data can be used to estimate what larger marine mammals might ingest based on their feeding rates on zooplankton. Using this method, they estimate a humpback, which is a baleen whale, could ingest more than 300,000 microplastic particles per day. In order to measure the presence of microplastics, zooplankton samples were collected and placed in glass-coated polypropylene well plates and immersed in nitric acid. The plates were then covered and heated, until all the tissue of the zooplankton was digested by the hot acid. The only things remaining behind were then examined under a microscope for the presence of microplastics. The Vancouver Aquarium Marine Science Centre is a non-profit society dedicated to the conservation of aquatic life. The Research Institute is grateful for its generous founding funding partners Sitka Foundation and North Growth Foundation.